We think we can help product owners and the people using these products be better at managing product feedback. This is why we built hellonext. There is a major difference between a good product and a great product. Good products are build with assumptions, where people use what they are given. Great products are build with the support from people evolve the product automagically. As a product owner, you tend to spend a lot of time listening to customer feedback. You reach out to them, follow-up, wait for their response and then curate the features or improvements they request in the tool that you use internally. For a product owner, all you have to do is just sign up. Once you sign up, you will have your own unique link, which you can use to gather product feedback. You also get a beautiful & minimal dashboard that clearly lists the features your customers have requested with the ability to tag the status of the feature request. This is what your customers would see. Why do you need hellonext? Because your customer is your king. 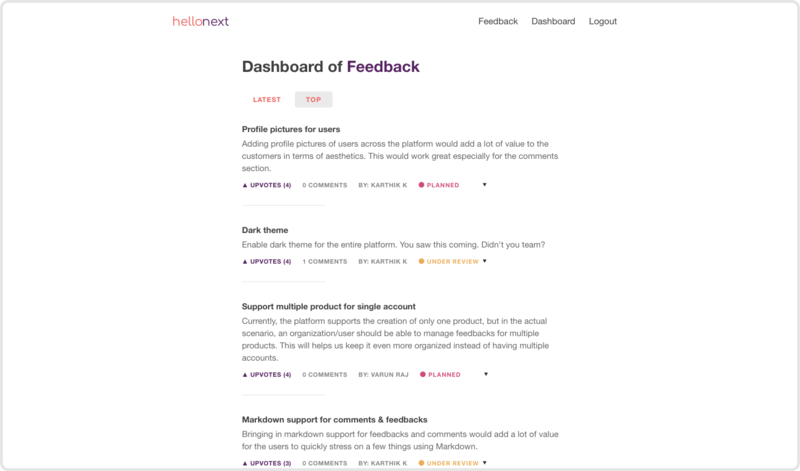 We believe hellonext will just help you get a high-level overview of what you should build next. You get to choose what to build ultimately. We understand the pain of building a product that customers love. We truly believe hellonext will help you take the right direction. Even a small help would help you a lot. We’re trying to help you with that. Oh hey, it would really help if you could share about us to your friends and more important, tell us what we should build for you in hellonext.